Description: NECR is northbound with long hood forward passing VTR 311 in the New England Central Railroad yar at Willimantic, CT. Description: Waiting in the New England Central Railroad yard for movement to Plainfield, CT by the Providence & Worcester Railroad. The 311 is to receive new VTR paint sans lettering in the Providence & Worcester paint shop at Plainfield. CT. 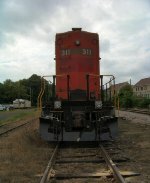 Description: Left side view in the Providence & Worcester Railroad yard at Plainfield, CT. Built 9/2001. DOT 112J340W. HazMat placard is 1075. Marked 'LIQUEFIED PETROLEUM GAS NOT ODORIZED'. 33726 gal cap. Length 67' 5". Description: Right side view in the Providence & Worcester Railroad yard at Plainfield, CT. Built 9/2001. DOT 112J340W. HazMat placard is 1075. Marked 'LIQUEFIED PETROLEUM GAS NOT ODORIZED'. 33726 gal cap. Length 67' 5". Description: VTR 311 waits along side STYX 72618 in the Providence & Worcester Railroad yard at Plainfield, CT. The 311 will be painted in VTR paint sans lettering by the PW paint shop crew. Description: VTR 311 waits in the Providence & Worcester Railroad yard at Plainfield, CT. Shortly the 311 will be moved into the PW paint shop for new VTR paint sans lettering. Description: Vermont Railway's 50th anniverserary unit was on hand sporting gold trucks and named for VTR's creator. Its hard to believe that Vermont Railway was formed 50 years ago from Rutland's ashes.